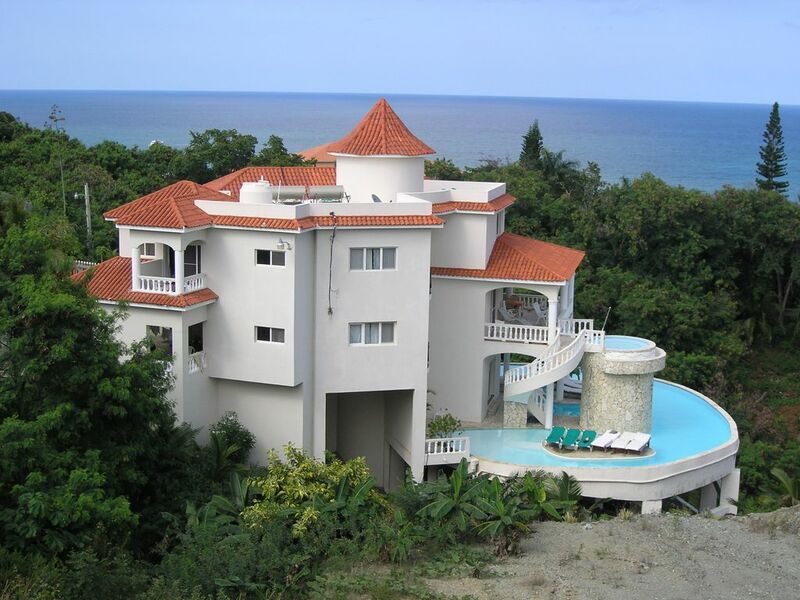 Bentley villa (named by our guests as James Bond) has recently been constructed and is of the highest quality. Located in the desirable altos de Cofresi it overlooks the Cofresi beach complex and has far reaching views along the entire north coast. The villa has 7 large bedrooms all ensuite luxury bathrooms (marble tops), A/C , fans and balconies. Over 45 original works of art . Main living area has mezzanine floor with 16ftx 12ft mural and 3 walk out doors to large balconies and hot tub. The games complex (billiard table, , etc.) has an equipped (6 piece)gymnasium with sea views and separate air conditioned private cinema with projector and our own popcorn machine. Wifi is accessible within the villa. The blue tooth speaker in the living room is portable, please feel free to listen to music in the sunshine outside! The infinity swimming pool (60000 gallons) has 2 islands with bridge and uses all commercial pool fittings. The temperature controlled jetted pool on the main living area floor has a waterfall that cascades down to the huge main pool and a seated grotto. Less than a 10 minute to beach and Ocean world. Full maid service, pool boy , night time security guard and chef included. A complimentary cocktail (piña colada) is served to each guest upon arrival. A personal chef is included from 8am to 3pm every day. Breakfast is served from 8am and a hot lunch is usually prepared for 1pm. A versatile menu is available, please let us know in advance of any dietary requirements or if you have any particular requests! Daily excursions available including the waterfalls, safari, and island trips, etc. A personal tour guide is available to visit you at the villa and arrange tours for your entire vacation. -Beauty treatments are available within the comfort of the villa by a highly recommended and experienced masseuse/beautician. A menu of treatments is available including facials, massages and manicures/pedicures. A beautiful (16 bed) luxury villa with sea and city views. Peaceful surroundings, relaxing, private. Your personal VIP getaway. Born 1947 in Hampshire England Originally lived in the Dominican Republic in the early 70s and worked there for many years in the Bank of Nova Scotia and Royal bank of Canada I designed and built Bentley villa in 2009 and it took 2 years to construct. I wanted it to be the best villa in Cofresi and it is that. The views from Bentley are tremendous and because of the elevation we can never have anyone overlooking us. I may be a bit old fashioned but I believe in giving good value and more than anything that my customers return here or recommend to their friends. We welcome children of all ages but wish to make clear that there are many areas that could be dangerous for unsupervised children and you should be aware of this. Non smoking villa but allowed outside and on balconies. “true” to the photos and best reviews! Paradise in Dominican Republic! A must stay again. The staff is extremely professional, helpful and attentive! Santa’s excellent management of events, Damino’s fablous meals kept us well fed, Carlos is the Best property manager and guest accommodations by the full service staff made our 10-day stay superb! A few notes: above all, truly an exceptional travel experience and stay! A few notes for future guests: the pool is not heated and very cold at this time of year, but the hot tub was perfect (after a few turns of the dial), the WiFi could use a boost (very weak signal), outdated fitness equipment and we had some interruptions of electricity (air conditioning off one day. But Carlos and Santa made sure we were happy and well taken care of. Diamo’s breakfasts and dinners were fabulous!!! We even had puppies!! I hope Rossi is doing well! We felt very safe with secure watch guard at night. Short walks to ocean world, beach and town made for easy trip to grocery, dinner out and walks on beach. Had a fabulous time. Views are breathtaking from every balcony and top patio. Star gazing at night in the huge sky enjoyed by all. You won’t be disappointed! This place is amazing! There really are no words to describe how perfect this villa is! The location is great, atmospheric and rustic, yet near to everything you need… 10 minutes down the hill and you have some shops and restaurants and the beach. The villa itself is just wonderful. So much space and beautifully laid out with wonderful accommodations and beautiful outside spaces to take in the incredible views. The pool is just beyond all wildest dreams! Must be the most incredible villa pool on earth! Finally the staff… the absolute highlight of our time! Santa is just delightful, will welcome you with a hug and organise absolutely anything your heart desires, and with a beautiful smile. Dioma is mama Dominicana and cooks the most delicious meals! Carlo is another lovely and smiling face, attending to the grounds and making sure everything is always looking its best. Cannot forget Santiago, the security who is there all night making sure everyone is feeling super safe and looked after. Thank you thank you to all of you for going above and beyond, for welcoming us like family and for becoming our Dominican family! We cannot wait to return next year, and in fact we are already discussing some plans with friends! To anyone considering this villa, just book it if you are lucky enough to have the chance and you won't be disappointed! Our stay at this villa was just perfect. A beautiful home which is very well maintained and very clean. The pictures and description of the villa are spot on, not exaggerated. The jacuzzi and pool are awesome. Overall an engineering marvel. The staff is exceptional. Happy and friendly and devoted to their job. Walked to the beach and market everyday. Very close to anything you need. A wonderful vacation and I highly recommend. I rented this house and I must say is about one of the best I rented. The view is beautiful, beautiful pool/Jacuzzi. In fact it’s a real Jacuzzi/hot tub, sometime you rent a house they said Jacuzzi but the water is cold but this one works very well. Also the house is equipped with multiple activities like pools, cinema and more. The service is extraordinarily. You have a cook and cleaning ladies and a guys can do your errands for you. Always here to help you. Included, they have a security guard all night to make sure the place the well secure. I personally found this very good deal and economical for the services, the size of the house and the views. We definitely rent this house again. Even better than the last time! This is the 2nd time we have stayed at the house and it was even better than the first time. Of course, the best part of the house is the staff-they are wonderful. Couldn’t ask for a better experience overall.